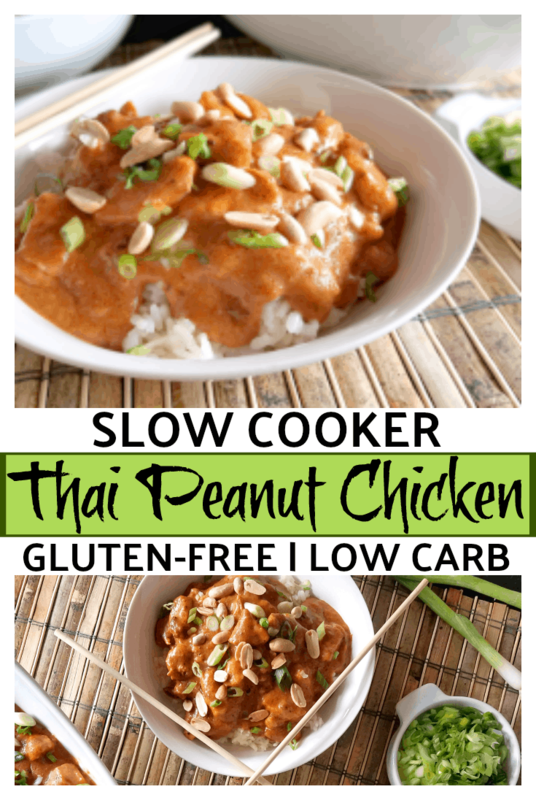 This Slow Cooker Thai Peanut Chicken is so flavorful and easily made Paleo! Thai Red Curry Paste adds a burst of flavor that marries perfectly with the peanut butter or SunButter and coconut milk. This is so easy to make, yet nutritious and satisfying! Serve over cauliflower rice for a low-carb meal. I’m a sauce girl. Whether it’s ranch, alfredo, pesto or aoli, I want sauce that tastes great and a lot of it. Yes, I’m the type of person to always ask for extra sauce or dressing, both because I hate food that is dry and because I enjoy the flavors that a good sauce provides. 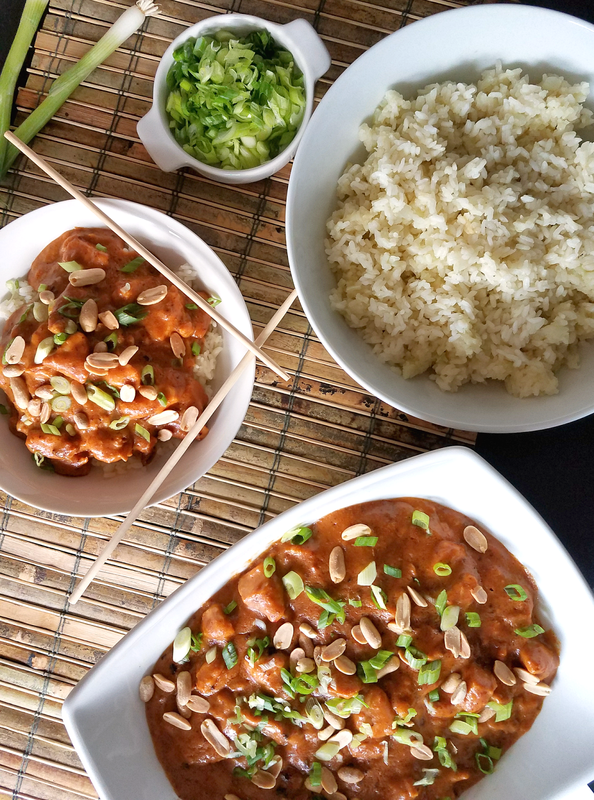 Being such a sauce lover, I’m excited to bring you this Slow Cooker Thai Peanut Chicken! I did a lot of prep work for this recipe, from trying a popular Slow Cooker Peanut Butter Chicken recipe on Pinterest to reading reviews of other Slow Cooker Thai Peanut Chicken recipes. The most common complaints were “too much peanut butter” and “bland”. Folks who left comments on Pinterest obviously wanted to taste more than just peanut butter in their peanut sauce! And who could blame them? 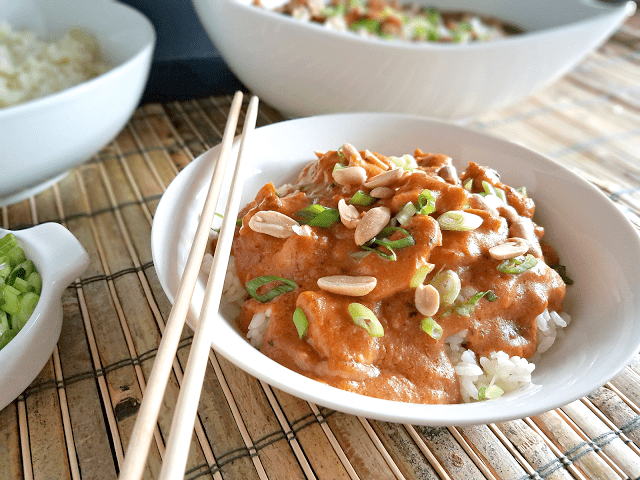 Good peanut sauce is bursting with flavor because it marries a lot of strong flavors. 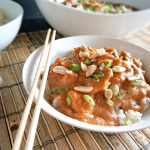 When done right, peanut sauce is delicious and versatile! Being someone who loves a good peanut sauce, I aimed to overcome the most common complaints by referring to my favorite Peanut Sauce recipe by Cooking with Amy. It is flavorful and well balanced without requiring any unusual ingredients from a specialty grocery store. I made sure to include Thai Red Curry Paste for extra flavor. The result is Thai Peanut Chicken made easily in your slow cooker or crock pot that is packed full of flavor and gluten-free, dairy-free and low-carb with a Paleo option! This Slow Cooker Thai Peanut Chicken is not just packed full of satisfying protein, it also provides healthy fat, fiber and lots of nutrients! Chicken: chicken is not only an excellent source of protein, it’s also rich in vitamins B3 and B6 and the minerals selenium and phosphorus. However, be mindful when choosing your chicken because the nutrient profile depends on how the chicken was raised. Research has shown that organic chicken has more omega 3 fats, and chickens that are truly pasture-raised also provide meat with more antioxidants, such as vitamin E (source). Peanut Butter: as I mentioned in my Chocolate Peanut Butter Smoothie and Peanut Butter Chocolate Chip Cookie posts, peanuts are packed full of good stuff like protein, fiber, vitamins, minerals and antioxidants (source). Coconut Milk: Well-Being Secrets shared a research-based article recently explaining the many health benefits of coconut oil with particular focus on the research showing that coconut oil supports weight loss. Although coconut milk is not as potent a source of the fatty acids thought to provide the health benefits associated with coconut oil, it still contains plenty of coconut oil. I’ve included Amazon links to products below for your convenience. Some of them are affiliate links, which means that I may receive a small commission if you purchase a product through one of my links. Thank you for supporting Taste Abounds! This Slow Cooker Thai Peanut Chicken can be served many ways. It would be delicious over Miracle Noodles or Kelp Noodles and vegetables (like bean sprouts, carrots and cucumber) for a complete low-carb meal, or it could be served over rice, if your diet allows it. It could also be served over rice mixed with cauliflower rice for a kid-friendly meal complete with hidden vegetables! I’ve found that Costco has low prices on organic peanut butter and coconut milk, as I mentioned in my article on organic pantry items to buy at Costco. However, Natural Grocers also has excellent prices on coconut milk and peanut butter that they grind in-store. Costco has great prices on organic chicken. Natural Grocers is a great alternative and only sells chicken that follows their strict Naturally Raised Meat Standard. This requires that chickens must have “access to the outdoors and ample space to express natural behaviors while they are inside” (source). See the link under the health benefits of chicken (above) for the many reasons why this is so much better! Be sure to use gluten-free soy sauce like this one to keep this recipe gluten-free. For the Paleo version of this recipe, use coconut aminos and a sunflower seed butter, like SunButter. 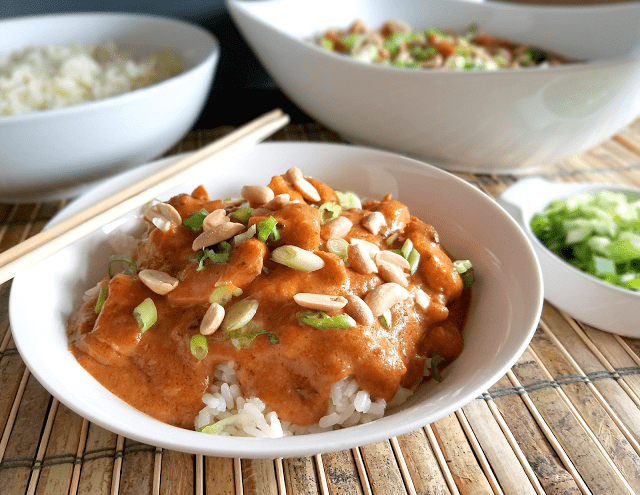 Thai Red Curry Paste adds so much flavor in this Slow Cooker Thai Peanut Sauce! I typically buy it at Natural Grocers, but it can also be found on Amazon. Sweet Red Chili Sauce is so good drizzled on top of this Crock Pot Thai Peanut Chicken that I should probably make it a mandatory condiment! My favorite brand is Thai Kitchen. Not only do I recognize all of the ingredients, I don’t see any ingredients that could be genetically modified. I typically buy it at Natural Grocers, but it’s also available on Amazon. For Paleo-friendly sweet red chili sauce, check out this recipe or this recipe from Swiss Paleo. You’ll enjoy this recipe, whether it’s the regular, gluten-free version or the Paleo version using coconut aminos and sunflower seed butter. This Thai Peanut Chicken is bursting with flavor either way and super nutritious! Now, on with the recipe. This Slow Cooker Thai Peanut Chicken is different from most similar recipes because it's so flavorful! Thai Red Curry Paste adds a burst of flavor that marries perfectly with the peanut butter and coconut milk. This is so easy to make, yet nutritious and satisfying! Gluten-free, dairy-free, low-carb with an easy Paleo option. Cut the chicken into 1-inch pieces. Place in a gallon size bag with the arrowroot and salt and shake until the chicken is coated. Set aside. Turn your slow cooker on to low or high (depending on how quickly you need the chicken to cook). Lightly grease the sides with coconut oil. Add the coconut milk, peanut butter, honey, soy sauce, lime juice, red curry paste and rice vinegar and wisk together until smooth using a silicone or nylon wisk (so you don't damage your slow cooker). Add the chicken to the sauce and stir until well coated. Cook on high for about 90 minutes or low for about 3 hours. Slow cookers vary, so please check your chicken for doneness with an instant read thermometer. The internal temperature should be 165 degrees. Serve on top of noodles, rice, cauliflower rice, or a combination rice and cauliflower rice. Add vegetables, like carrots, cucumber or bean sprouts for a balanced meal. Top with the desired garnishes listed above (I recommend all for the most robust flavor). Enjoy! Disclosure: this post includes affiliate links for convenience. I am a participant in the Amazon Services LLC Associates Program, an affiliate advertising program designed to provide a means for sites to earn advertising fees by advertising and linking to Amazon.com.